The Spring Tour for 2013 brings our group to the Edgecombe County area for the first time in NCPHS history. Tarboro and Princeville have a rich, historic heritage, and we will be presented with much information from local historians. We will also visit four local Presbyterian churches that continue to make their presence known in the area. Tarboro likes to call itself “a small town that is big on culture.” We will explore that culture as we tour some of its historic sites. The town is unique in North Carolina, being home to one of only two existing original town commons in the United States (Boston being the other). Designed by town organizers in 1760, the Town Common provided grazing areas for livestock and served as a focal point for gatherings and activities for the fledgling community. On one side of the Common a cotton press is on display – the last of its kind in North Carolina. Constructed in 1840, it was moved from an Edgecombe County farm to the Common prior to its restoration. 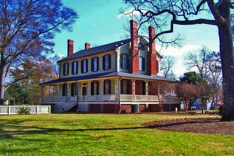 Adjacent to the Common is the largest Historic District in North Carolina, filled with beautiful homes of varying architectural styles, many listed on the National Register of Historic Places. The Grove, now called the Blount-Bridgers House, was built in 1808 by Gen. Thomas Blount as a plantation house just outside the colonial town boundaries. It now houses Edgecombe Arts, many exhibits, and the Hobson Pittman Gallery. Pittman, a renowned artist in several media, was once a resident of Tarboro. We will also visit the Historical Gardens and the Pender History Museum found on the property. Our tour will begin, however, in Princeville, across the Tar River from Tarboro. It was settled as Freedom Hill in 1865 by former slaves. In 1885, Princeville was incorporated as the first black municipality in North Carolina and the name was changed to honor Richard Turner Prince, a leader in the community. The low-lying ground on which the town was built has frequently been flooded by the Tar River. The State of North Carolina and Army Corps of Engineers constructed a series of dikes to protect the town in the mid-1960s, but four devastating floods have breeched the dikes and flood control system since then. Our leaders at the Princeville Museum and Visitors Center will share the interesting history of the area and the community's amazing resilience and resolve. The entire town has been rebuilt after being under 24 feet of water in the flood following Hurricanes Dennis and Floyd in 1999. The focus of the tour of churches will be four Presbyterian churches and one Episcopal church. Nahalah Presbyterian is a small, rural church located about 13 miles from Tarboro. It is the only Presbyterian church in Halifax County, and has been yoked with Tarboro churches. Nahalah, perhaps named from the Hebrew word for inheritance, has a beautiful wooden building and some interesting stories, one of which involves Ralph, the Presbyterian Boston Terrier featured on WRAL’s Tar Heel Traveler. William and Mary Hart Presbyterian Church is a lovely church located in the community of Leggett. Originally named Olivet, it began in 1890 as one of two mission Sunday Schools from the Tarboro church. The first wooden building, adjacent to the Leggett family graveyard, was dedicated in 1892. That building was moved to its present location in 1921 so a new brick church building could be built beside it. William Almon Hart donated funds and materials for the construction of the new church, and it was named for his two infant children. It is said that 800 people attended the dedication service for the new building. In 2001, the Olivet Fellowship Building (the original church) was completely modernized and remodeled. The year 1869 saw the beginning of a movement to form a Presbyterian Church in Tarboro, thanks largely to Anna Stamps Howard. Raised a Presbyterian in Caswell County, she married Judge George Howard, Jr., of Tarboro in 1861. Amazed by the lack of any Presbyterian influence in Tarboro, she became a driving force for the establishment of a Presbyterian church, especially influencing her unaffiliated husband. By 1869, money was being raised, and permission was granted by the town for a Presbyterian church to be built on a lot at the edge of the town cemetery. The land was leased to the congregation for $1 a year, but was deeded to the church in 1878. In 1874, a church was erected, and Orange Presbytery met there that year. In 1909, due to the efforts of the children of Judge and Anna Howard, a new church was built on the same site and named Howard Memorial in honor of their parents. In recent years the church has taken over the care of the adjacent town cemetery. We will also visit Cobb Memorial Presbyterian Church in Tarboro, a smaller daughter church of Howard Memorial. As part of our tour of downtown Tarboro, we will visit the beautiful churchyard at Calvary Episcopal Church. The arboretum was established and designed by Rev. Joseph Blount Cheshire, and it contains many native as well as exotic and unusual plants, shrubs, and trees. While we visit Calvary, be sure to note the beautiful stained glass windows and the ornate and interesting monuments on the grounds. Please make your plans to attend this tour of new territory for the NCPHS. You will find a schedule, hotel and registration information, and directions here. Have you seen the movie "Lincoln"? If so, you'll remember the African-American woman who was a dressmaker and companion to Mrs. Lincoln. Her name was Elizabeth Hobbes Keckly, and we learned about her on our 2007 tour of Hillsborough and the Burwell School. Born in 1818 as the daughter of her owner and an educated slave woman, Elizabeth grew up in Virginia, but in 1835 she was sent to Photo from UNC-CH Libraries Hillsborough, NC, with the owner's son, Rev. Robert Burwell, and his wife Anna. Robert was the minister at Hillsborough Presbyterian Church and started the Burwell School, one of the earliest female academies in NC. After the birth of her son, Elizabeth returned to Virginia and the home of Burwell's younger sister. Eventually she and her mother moved with the family to St. Louis, where Elizabeth became a noted seamstress, bought freedom for herself and her son, and married James Keckly, a marriage that did not last. As Mrs. Keckly, she moved to Baltimore and then Washington, DC, in 1860. As an independent dressmaker, her clients included Mrs. Robert E. Lee, Varina Davis, and Mary Todd Lincoln. In March 1861 she became Mrs. Lincoln's dresser, and then her confidante and companion, and she did indeed witness many of the events of Lincoln's presidency. Her son George enlisted as a white man in the Union Army and was killed in August 1861. During the war she founded an organization for the relief of freed slaves and sick or wounded black soldiers in Washington. After Lincoln's assassination she remained a close friend of Mrs. Lincoln's until 1868, when she published Behind the Scenes Or, Thirty Years a Slave and Four Years in the White House. Mrs. Lincoln felt Elizabeth had violated her confidences, and the book was severely attacked in the press. She lost most of her white clients and struggled to make a living by sewing and teaching sewing. In 1892 she was given a position at Wilberforce University as head of the Dept. of Sewing and Domestic Arts, but by the late 1890s, in poor health, she returned to Washington and died there in 1907. For more on her extraordinary story, see www.burwellschool.org or Wikipedia. The Tour Booklets that we put out every year for our two-day tour are to be scanned and will become part of the Religion in North Carolina Digital Collection, available on-line. They are of interest to the project primarily because they contain brief histories and photos of the churches we have visited, and they are also a record of our society. Our archives include booklets from 1968 to the present, with the exception of 1989, when we visited Bluff, Barbecue, Longstreet, the Mill Prong House, and the Highland Games at Red Springs. If anyone has a program from that meeting, please let Barbara Cain know. If you know of a recently published church history or a completed history project that you feel is worthy of consideration for an award, please send the book or a description of the project to Awards Chairman Mrs. Joy Heitmann by Friday, April 5. The Executive Board of NCPHS met at the home of Joy Heitmann on Saturday, January 19. After the meeting was opened with prayer, the minutes and treasurer's report were approved. Since several of our members had expressed concern and disappointment that the Scottish Heritage Symposium at St. Andrews was this year scheduled for the same weekend as our Spring Tour, it was decided to change the dates of our meeting to Friday and Saturday, April 19-20, if that was acceptable to our host churches. It was decided that our Fall Meeting this year will be held in Hickory on either Oct. 12 or 19, and the Spring Meeting of 2014 will be in Edenton on April 25-26. Since the webmaster we employed had not updated our website after repeated requests, he is to be replaced. Someone else has been found to do the work on a trial basis. The board voted to approve John Myhre as our official treasurer, so that all the reports on our funds will be sent to him. As president, he will appoint a nominating committee to secure officers for election at our Annual Meeting this fall. The board also agreed to continue our membership in the Federation of North Carolina Historical Societies, for $25 / year. Barbara Cain reported that the Ulster Historical Foundation in Belfast had contacted the society about the possibility of organizing an Irish research workshop to be held somewhere in NC, specializing in the emigration of Presbyterian Scotch-Irish from Northern Ireland to North Carolina. She asked them for more specific information, but they have not responded. It was agreed that Barbara would talk to Ron Vinson about the possibility of such a workshop at the Presbyterian Heritage Center in Montreat. In response to a request from the Duke Divinity School Library, the board granted permission for digitization of all our annual tour booklets, 1968 to present, for the Religion in North Carolina Digital Collection. The final discussion concerned ways to let more people know about our society. 1) Sam Martin has compiled a list of the present-day Presbyterian churches in NC with their dates of organization, if he can find that information. When a church has a significant anniversary, NCPHS presents them with a certificate of recognition. These are formally delivered to the church representatives at one of the presbytery meetings during that year. (2) Barbara sends out newsletter or bulletin announcements of our meetings by email to Presbyterian churches whose email addresses are given on the presbytery websites, but many are not. We also ask the presbytery offices to include announcements of our meetings in the information that goes out to each pastor or clerk of session. If possible, however, we need to develop contacts with the historians of Presbyterian Women in each church. (3) It is also very important to keep our website up-to-date and expand it, and we are working on that. (4) The very best way to expand our membership, however, is for members just to invite a friend to come along! You know they will enjoy it. Try it in April! Three of our long-time members have died during the past six months. We will miss each of them very much. On Nov. 5, 2012, Margaret Faye Maness McGinnis died in Raleigh at the age of 87. Having grown up in Biscoe, she attended Flora MacDonald College, where she majored in English, Bible, and Music. As a DCE at Tenth Ave. Presbyterian Church in Charlotte, she met and married Rev. James W. 'Mac' McGinnis. Together they served four Presbyterian churches -- Guilford Park in Greensboro, Raleigh First Presbyterian, Havelock, and Cary Presbyterian. Faye hosted church events, directed choirs, taught all levels of Christian education classes, and helped establish an accredited kindergarten program at the Cary church in 1959. After their three children were grown, Faye earned a Master's in Music Education at Chapel Hill and taught music in the Wake County elementary schools for 26 years. She and Mac were instrumental in the establishment of Glenaire Retirement Home in Cary and were among the first to move in. Faye was a very supportive member of our society for a long time. She attended a great many of our meetings and tours over the years, and often expressed her appreciation for them. She will certainly be remembered and missed. Katherine Bowden Powell died on Nov. 6 at the age of 88. Kay was an active member of White Memorial Presbyterian Church in Raleigh and a frequent volunteer at Wake Relief, providing emergency food to Wake County residents in need. She was also a volunteer helping children at the Loaves and Fishes Ministry. She was married for 45 years to William Isaac Powell, who pre-deceased her. We offer our sincere sympathy to her friends and family, especially Kay's sister, Becky Bowden of Durham, who is also a member of NCPHS. Cornelia Grissom McLeod, 88, died in Durham on Dec. 17, 2012. A native of Vance County, she graduated from Peace College, began work in an office, then met Randall A. McLeod on a blind date. They were married for 62 years and worked together in their Durham business, Piedmont Printers. Connie was a longtime member of First Presbyterian Church in Durham, where she was a faithful Tuesday afternoon office volunteer and was active in Presbyterian Women. She was known for her quilting and handicrafts, and initiated the Chrismon making project, which continues to decorate the church Christmas tree annually. Our sincere sympathies go to her family, including her husband Randall and his cousin Sally MacLeod Owens, members of NCPHS. If your church records need to be microfilmed for preservation, the Presbyterian Historical Society in Philadelphia provides archival quality microfilming services and subsidizes about half the cost. Furthermore, if your church is more than 50 years old and has fewer than 250 members, you can apply for a Heritage Microfilming Grant of up to $500. Applications are due annually on October 31. For more information, call (215) 627-1852 or see www.history.pcusa.org/preservation/microfilm.cfm. If your church has old photographs and/or documents on display in an historical room that is open to the public, and if you would like advice on how best to preserve them, you can apply to the State Archives in Raleigh for assistance through their Traveling Archivist Program (TAP). The program is expected to be offered again this fall. If you would like to receive notice of it, please email or call Andrea Gabriel, andrea.gabriel@ncdcr.gov, (919) 807-7326. Last October we had the opportunity to visit the Scottish Heritage Center on the campus of St. Andrews University in Laurinburg, and to hear from its director, Mr. Bill Caudill. In addition to his responsibilities at the Center, Bill teaches and leads the college's award-winning Scottish Pipe and Drum Band, organizes the annual Scottish Heritage Symposium, and is himself a recognized authority on the Scottish settlements in North Carolina. He spoke to us on the use and duration of the Gaelic language in the Cape Fear and Pee Dee regions of North and South Carolina in the 18th, 19th, and early 20th centuries. For most of the 18th century, North and South Carolina had the largest group of Scots Gaelic speakers in North America. Our sources of information about them are almost entirely the Presbyterian churches they established and the expressed need for Gaelic-speaking ministers. Their geographical scope in terms of churches was from Buffalo and Euphronia in the north to Little PeeDee and Red Bluff across the line in South Carolina, Morven and Mt. Carmel in the west, and Black River in the east. It is interesting that while the Presbyterian church certainly helped perpetuate the Gaelic language in NC, it discouraged Highland music and dance, both of which survived among Catholic Highlanders in Nova Scotia. The first group of Highland settlers could not persuade a minister to come with them to NC in 1739, but there was a strong tradition of home devotions in Scotland, and some ruling elders may have been in the group. The leaders of all the immigrant groups would have been bilingual, but most of the settlers were not. The first Gaelic-speaking minister, James Campbell, came to Barbecue, Bluff, and Longstreet in 1758, but later left for Mecklenburg because of his Patriot sympathies. Revs. John MacLeod and John Bethune were both Loyalists and left during the war. Dugald Crawford was with a British regiment leaving Charleston but was persuaded to stay and minister to the congregations of Raft Swamp and Philadelphus. He later returned to Scotland but left two sermons printed in Gaelic, the first items printed in that language in North America. There must have been many who were literate in Gaelic, but it was more of a spoken language. In 1790 Rev. Colin Lindsay was called to the Black River church and preached in Gaelic at many churches south of the Cape Fear, an area that was still being settled by Highlanders. Rev. Angus McDiarmid came in 1793 to the churches of Barbecue, Bluff, and Longstreet. Both were anti-revivalists and had problems with Orange Presbytery. Immigration from Scotland slowed in the 19th century, although it picked up for a time in the 1830s. The language was still in use, but most churches were becoming bilingual. In 1826 a collection of New Spiritual Hymns was printed in Gaelic in Fayetteville, for which there was presumably a market. Several churches were primarily Gaelic-speaking into the 1830s, including Little Pee Dee in Dillon, SC, and Mt. Carmel near Ellerbe. John McIntyre of Scotland helped organize Fayetteville Presbytery and then traveled through the South, preaching to Scots who had migrated to Alabama and Mississippi. His son Daniel was ordained in 1828 and preached in Gaelic at churches that still had Gaelic speakers, including Laurel Hill, Ashpole, Centre, Red Bluff, and Little Pee Dee. In the 1830s Rev. Colin McIver arrived from the Outer Hebrides. He was clerk of Fayetteville Presbytery and of the Synod of NC, and worked on a new translation of the Shorter Catechism into Gaelic. The brothers James and John Sinclaire spoke Gaelic and served Ashpole & Smyrna and Galatia & Barbecue respectively. After the Civil War they both went to Philadelphia, where they preached at Love Grove A.M.E. Zion to Gaelic-speaking former slaves. After the war a Gaelic newspaper from Toronto was distributed for a time in the South, but the language gradually died out. In 1919 Angus McLean found two people still fluent in the language, but the last died in 1923. It survives, however, in Southernisms like poke, biddies, smidge, and stob. Lunch was in the very pleasant dining hall of Scotia Village next door to the Scottish Heritage Center. After our business meeting, we left for Old Laurel Hill Presbyterian Church, established in 1797, where Ms. Sylvia McLean greeted us. Built at a crossroads, the community was a stagecoach stop between New York and New Orleans. The beautiful frame building with its cupola was built in 1856. Gen. Sherman and his troops camped there one night and used the church pews to cross the creek. Later, the Laurel Hill community followed the railroad, and the Church in the Pines is located there. 12:00 - Registration at Princeville Visitors Center and Museum, 310 Mutual Blvd., Princeville. From Hwy 64, take Exit 486 into Princeville on Mutual Blvd., crossing Main St. at the light. The Center is on the right, just past the Dollar Store. 1:00 - Presentation on the History of Princeville. 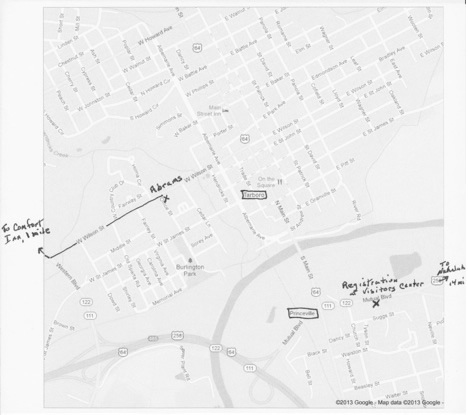 5:00 - Leave for Comfort Inn, 1504 Western Blvd., Tarboro. Check in, freshen up, relax. 1:00 - Lunch from "On the Square"
Registration will be at the Princeville Visitors Center, 301 Mutual Blvd, Princeville. From Hwy 64, take Exit 486 into Princeville on Mutual Blvd., crossing Main St. at the light. The Center is on the right, just past the Dollar Store. The Comfort Inn of Tarboro is located at 1504 Western Boulevard. Arrangements have been made for a special rate of $63 for a room with either two double beds or one king-size bed. Please contact them directly at (252) 824-0088 and identify yourself as a member of the North Carolina Presbyterian Historical Society in order to get the reduced rate. © 2013 North Carolina Presbyterian Historical Society. All rights reserved.